Yesterday was my regular weekly trip to Barnsley Archives. Having been out with the OH to take photos of two war memorials in Darfield last weekend I was keen to find out a bit more about them so I made that the main focus of my research for the whole visit. I've been very busy this week, firstly with three booked talks for Spirit and Healthy Bones, community based organisations which promote health and involvement for older and disabled people. I have also been preparing for the Barnsley History Day, which is Sunday 23 February in Barnsley Town Hall. I will have two hats on the day, Cudworth Local History and Heritage and Barnsley War Memorials Project. I am also still frantically reading for my Open Uni module (A327 - we've got to post WW2 reconstruction) and planning my next talk which will be in Rotherham in early March on WW1 soldiers. My talk last week at Cudworth Community Fire Station on WW1 soldiers in Cudworth and their families seemed to go well and the groups on Monday, Tuesday and Wednesday this week joined in enthusiastically helping me identify strange items from the pub inventories such as maghy napkin stands and pancheons. I now have a contact in Darfield - SM came to the meeting of the Barnsley War Memorials Project and she has offered us the chance to access the local church and take photos of the internal memorials. She is also thinking about booking me for a talk to the Friends of Darfield Churchyard - we just need to discuss a date. My research yesterday began with two hours searching through the digitised Barnsley Chronicle for mentions of Darfield from 1922 right up to 1930. 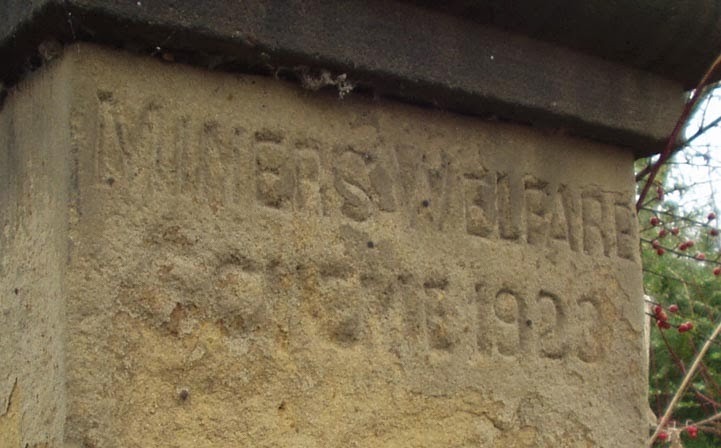 I had taken a photo of the gatepost of the little park where the memorial known as the Darfield Cenotaph stood, listed on the Imperial War Museum's War Memorial Archive as Welfare Park I wasn't that surprised to see that the wording read "Miners Welfare Square 1923". Cudworth too has a Miners Welfare Park, they were a common phenomenon in the inter-war years. There was a mention in January 1923 of the dedication of a window in the church to accompany the memorial plaque which had been installed in July 1921. I found an article on the opening of the Miners Welfare Park in July 1923 and then ... nothing ... for years and years. I try not sit at the computer for hours and hours - it's not good for you. So after the first hour I went for a wander around and asked the staff, (all the young chaps yesterday!) for assistance with my search. They suggested the Darfield Council minutes, the file boxes of Darfield history research (wow! - eight or more bulging file boxes on the open shelves) and the ephemera collection which is in large cardboard boxes filed alphabetically by place on the bottom shelves of the bookcases. A picture in a little book of Darfield history called "A Postcard from Darfield" provided the information that the memorial had been unveiled in 1931. I returned to the Barnsley Chronicle invigorated and continued to search - 1928, 1929, 1930 - jackpot! 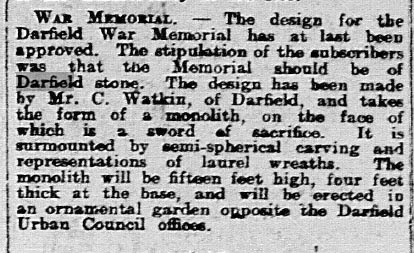 In February 1930 the Barnsley Chronicle reports that the design for the Darfield War Memorial has been approved, it "takes the form of a monolith, on the face of which is a sword of sacrifice. 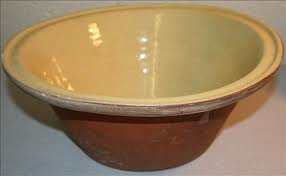 It is surmounted by semi-spherical carving and representations of laurel wreaths. The monolith will be fifteen feet high, four feet thick at the bse and will be erected in an ornamental garden opposite Darfield Urban Council offices". The subscribers had asked that the memorial be made of Darfield stone, the same stone used in the local church. Later that year the report appears on the unveiling of the memorial. This cutting can be found on the Barnsley War Memorials Project page for the Darfield Cenotaph along with a full transcription the names of the fallen men. World War Two names have been added at some point since and these are also transcribed on the BWMP page. Well, that's one memorial resolved - now what about the other one? This is the Middlewood Shrine, so called because it was apparently donated by the local landowner who lived at Middlewood Hall. That is pretty much all the War Memorials Archive can tell me about this rather unusual structure. It stands on the right hand side of the A635 Doncaster Road as you go down the hill just after the junction with Nanny Marr Road. When we photographed the memorial I commented to the OH that the stone just didn't look like it had been outside for nearly 100 years. Since we discovered the relocated Billingley Chapel memorial a few weeks ago I've been much more open minded about the provenance of these memorials. At the corners of the stone are quarter circle indentations with no apparent purpose. They look just like the shape of mirror plate fittings. 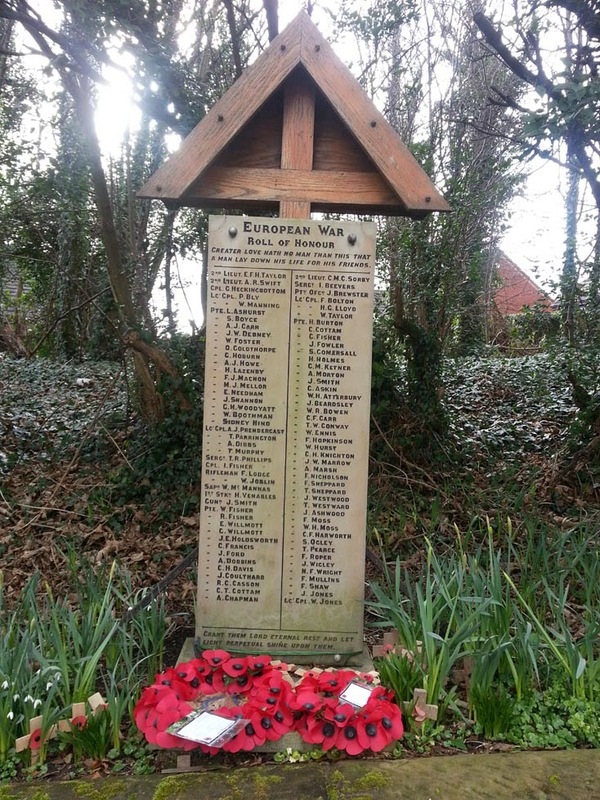 The inscription states the "European War" so that dates the stone to before 1939, and the list of names is very, very similar to the one on the cenotaph and the plaque in the church. Could this be a plaque originally situated in a local chapel or social club which was relocated to this roadside location when its intended home was lost? However there was no mention of this memorial in the Barnsley Chronicle up to the end of 1930. Nothing in the Darfield Council minutes, although to be honest the cenotaph itself only got the briefest mentions, and nothing in the blue file boxes of local research. I am hoping that the various history and church groups in Darfield will be able to help me on this. And finally my find of the day - a bit of background first so you'll understand how great this was. A long time ago I discovered a picture in a local history book, "Barnsley 1890s to 1990s" by Brian Elliott. It is of the Darfield and District Conservative Club Roll of Honour and includes a picture of one of the OH's distant relatives Walter Jobling, who was killed in May 1918 and is remembered on the Tyne Cot Memorial in Belgium. We visited the Cemetery in 2009 and took a picture of his name on one of the dozens of panels listing 35,000 servicemen whose graves are not known. 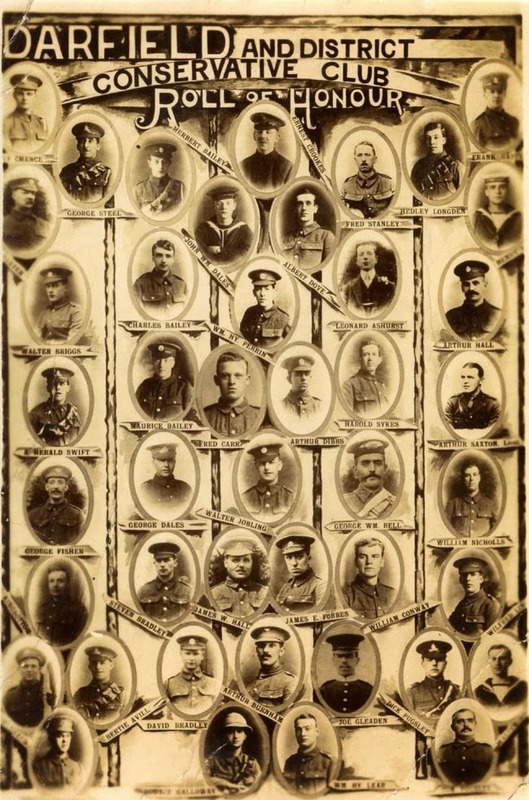 Knowing that this picture would probably help identify many of the men on the Darfield memorials I emailed Brian and asked if he had a better copy of the image and if I could have his permission to use it for the Barnsley War Memorials Project. He did (see right) and provided I gave him the usual credit he was happy for me to use the picture in connection with the project. Now this picture is great, much clearer than the one in the book and Brian was able to tell me that it is of a rare Warner Gothard postcard in a montage 'style' frequently used by Gothard for commemorations of events and disasters. It is possible it was commissioned by the club to remember their members and a larger framed copy may have existed at some point. Another thing to research! Unfortunately the image is cut off at the sides and goes a bit fuzzy at the corners and one of the soldiers has a tear through his face. So you can image how much I squealed at about 1pm yesterday when I found an A3 greyscale photocopy of another version of this image in one of the blue Darfield research file boxes. This time all the names are clear and legible and there is no cut off at the edges. Being a copy of a copy the photos of then men are nowhere near as good as they are on Brian's copy, but for the names it was invaluable. I was only too happy to give the Archives my 40p for a copy! 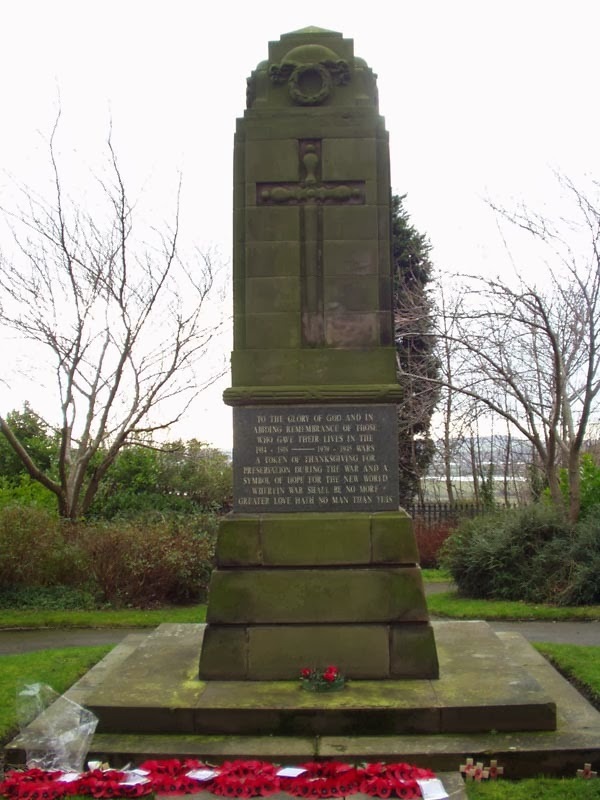 Later today I will write up pages on both the Middlewood shrine and the Darfield Cons Roll of Honour and post them on the Barnsley War Memorials page. I'll come back and link to here when I've done that. But for now, over tired from a week of far too much history I think I'm going to have a bit of a break and some lunch.